A year ago, in “Mobile Live Streaming Looks Like An Important New Video Category,” I asserted that, after playing around a bit with Meerkat and Periscope, I was convinced that live-streaming had huge potential. I envisioned lots of interest in both personal and professional uses across breaking news, promoted broadcasts and companion streams to larger events. Fast forward to yesterday, with Facebook launching a slew of new live-streaming features to Facebook Live, building on its initial launch of live video as part of Mentions last August. With Facebook doubling down on live video, I think it’s pretty clear this is a category that is poised to soar, as infinite applications crop up. In a short video Q&A, Facebook chief product officer Chris Cox provided a glimpse into how Facebook Live has already been used successfully. He cited diverse examples such as Hillary Clinton taking fans behind the scenes, Steven Spielberg answering questions, a Texas weatherman taking viewers on the road to go storm-chasing, the Manchester City soccer team streaming goalie practice, and more. Cox put his finger right on why these videos work, saying “they’re fun because they’re raw and authentic.” That might sound familiar because that’s exactly what Facebook itself is all about: allowing users to capture and share authentic, intimate personal moments with their fans, friends and family. In fact, Cox went on to say that the next time you’re taking a photo or video to share, think about going live right then instead. In the 8 months since Facebook launched Live, it has clearly concluded that live-streaming is the next big extension of personal sharing, enabling Facebook to be even more central to users’ lives. Yesterday Facebook introduced a number of new features that makes live video easier to create, share and discover. 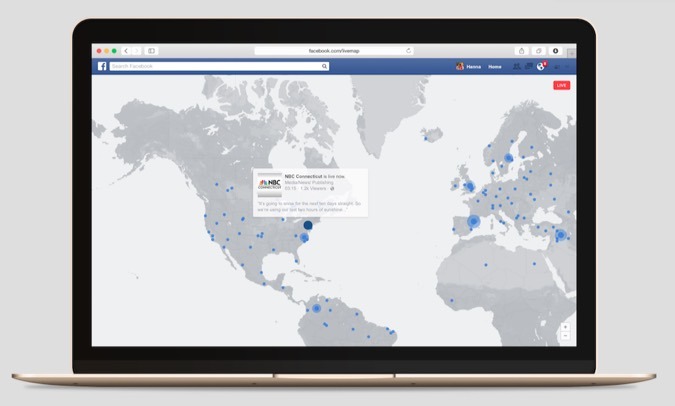 Included are ways to live-stream in Facebook Groups and Events, to provide live reactions and importantly to send invitations to friends and to peruse a map of where live videos are coming from. This latter feature strikes me as incredibly powerful for following breaking news (think about witnesses live-streaming in the aftermath of a terrorist attack). For a sense of how important live video has become to Facebook, Cox said that the company has dedicated “hundreds” of engineers to building the product. He highlighted the difficulty of enabling synchronous streaming for large audiences anticipated to view celebrity or breaking news streams. He also emphasized the complexity of building live for many different phones, geographies and networks. Of course these are just the investments Facebook is making on the technology side. As has been reported, Facebook is also investing in content, by paying both celebrities and broadcasters to ramp up their use of live-streaming. This would play an important role in introducing millions of users to Live, which would in turn stimulate their own live-streaming. Now that Facebook, with its massive reach and resources, has clearly prioritized live-streaming, I’m even more confident that live-streaming is going to become a major new video application. The mind boggles at how many different professional and personal live streaming opportunities exist, and how many creative monetization paths will be developed as well (see Al Roker's new startup as just one example). Facebook is riding a perfect storm of proliferating smartphones as robust video capture devices, individual self-expression, professional media innovation and video adoption to succeed with live video. It’s going to be a lot of fun to see this all unfold.